Mobile technology and platform designed for meetings, conferences, trade-shows, festivals and events. It has never been easier for visitors and fans to buy tickets. Combine meaningful data and turn them into understandable profiles. Reach target groups on their mobile phones and offer smart ticketing. Buying behaviors are constantly changing. We fulfill the needs of the event organizers and artists with the capacities of technology. Build real time customer profiles, target segmented groups with marketing campaigns. Sell tickets and merchandise more easily and watch your brand grow with our mobile solutions. All from one platform. Knowledge has become indispensable. Influencing choice behaviors of visitors requires insight into individual preferences. We help the event industry with our Customer Data Platform (CDP). Automatically collect and transfer data to real time customer profiles. All interactions – such as ticket orders, payments, previous conversations, preferences, buying behavior etc. – come together in comprehensible customer profiles. This gives great insights and knowledge. From there it is a matter of a few clicks to start automated personalized communications with your target audience. Random mailings and social media posts are not enough to expect brand loyalty. How to make your brand messages stick? Our platform enables the event industry to automatically match preferred communication channels to an individual fan. Reach target groups with an extensive set of integrated marketing tools. Think of SMS, voice messages and mailings. Easy to use for effectively spreading personalized special offers, ticket shop links, Spotify music updates and the latest festival information. That makes your communication relevant and improves the return of your marketing efforts. Knowing and understanding your customer preferences and needs, you can shrink the buying process. Shorten your current customer buying journey with the combination of our platform solutions. Easily segment your customer data to specific target groups. Reach them by their preferred communication channel such as SMS, Facebook Messenger, RCS, Whatsapp or Push. Send personalized messages and add a direct link to your shop. In one flow your target group can place orders – check the prefilled forms - and complete payments. Everyone should be able to purchase a ticket with just one or two clicks. Keep it simple. Give your team an excellent system to manage and drive ticket sales, or to sell merchandise. Our event technology contains a complete set of features such as personalized tickets, seated ticketing and all possible design options. Also ask us about our ticket resell solution, enabling ticket owners to resell their tickets when they are unable to attend the event. CM.com is front runner in event solution development and continually focuses on the newest technologies. This guarantees event organizers and artist managers reliable data, innovative marketing tools, integrated payment methods and sales solutions. 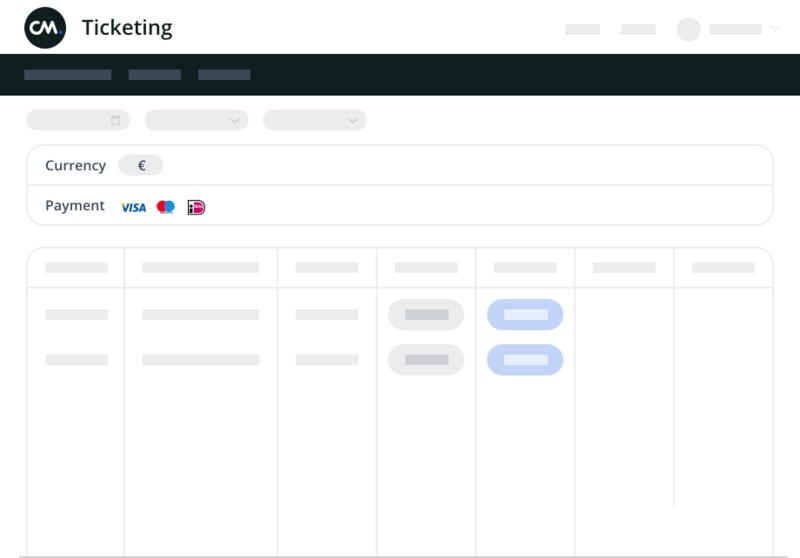 With CM Tickets your team is given a wide package of features - such as personalized ticketing, the ticket resell module, seated ticketing and many design options - to create the perfect white label customer journey. The data solution provides insight into your target groups as a starting point for personalized sales campaigns, quick orders and easy payments. Audio is a powerful means to convey a message. Send pre-recorded audio messages to your visitors and fans and grab their attention.